After being accused of a crime he didn't commit, Keisuke Amazawa has no choice but to dive into the digital world and investigate to prove his innocence. Even if that means joining a group of hackers and help them to solve the troubles threatening this mysterious universe. Hackers in the Digital World are divided into groups with different objectives. Some will cooperate whilst others fight each other to destroy the dimensional barriers and invade the real world. The largest hacker group, “Zaxon”, will strongly fight to protect the Digital World. One member, Jimmy Ken, is unsatisfied with the management so decided to create his own group called “Demons”. Confusion reigns in the Digital World especially with this mysterious hacker named K who wants to chase the criminal who is hunting for your account. 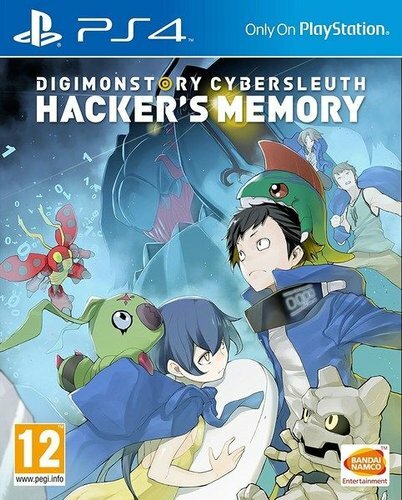 In DIGIMON STORY: CYBER SLEUTH - HACKER’S MEMORY players will be able to battle against each other with Digimon they have trained. The Network Battle experience has also been enhanced. Rank Battle mode has pre-determined rules and rating points. Event Battle rules will change every 2 weeks. This special mode won’t affect players’ score but will reward players’ with items. In the Free Rule Battle, players will be able to create a room with its own rules and invite up to 8 friends. The coins earned from Rank and Event Battle modes can be used in the Coin Shop to purchase accessories to equip your Digimon or change the appearance of your character in the online mode. CYBER PUNK ATMOSPHERE: Dive into a deeper and darker adventure, at crossroads between real and digital. DEEP AND ADDICTIVE GAMEPLAY: Experience the perfect mix between adventure, raising and battle with over 320 Digimon to discover! Enjoy a wider range of battle strategies in a classic turn-based gameplay enhanced by Digimon's skills, compatabilities and combos. THE UNTOLD STORY: Discover the mysterious backstory to the events that happened in "Digimon Story: Cyber Sleuth".